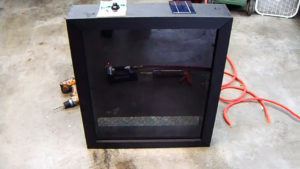 This video series shows step by step the build and installation of a Simple Solar Air Heating Collectors that uses no electricity or batteries made from salvaged materials.The air enters at the center bottom of the collector, where an aluminum baffle spreads the flow across the width of the collector on the glazing side of the screen absorber. The air rises up between the glazing and the absorber, and eventually finds its way through the three layers of screen absorber and flows to the back side of the collector. The air then flows up the back side of the collector to the exit vent located at the top of the collector.